Raising My Little Superheroes : The Mask. There is one aspect of my children's autism that people really struggle to comprehend and understand. "But they look so confident and calm." 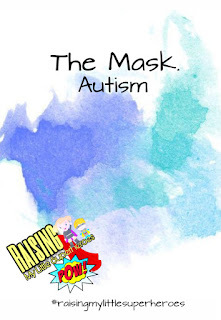 It's called Autism Masking. And yes it is very real. People struggle with the concept that a child can hold it together all day - that a child is quite capable of holding in all of their anxiety and frustration - and appear to be perfectly okay on the outside. And yet when they arrive home, to their safe zone, they explode. People just can't seem to fathom that my seemingly calm and confident 9 year old daughter can turn into a Dr Jekyll/Mr Hyde character the minute she leaves the school ground. L has also recently started withholding his anxiety and frustration throughout the school day and exploding at home. At times we have resorted to recording O, and L, when they have been in this state of completely-out-of-control at home to show the school what occurs on a semi-regular basis. Until we show O's teachers a video of her melting down at home, they simply cannot believe that the mild mannered, courteous child that they see day in day out, is capable of such an action. I've spoken to O about this post and asked her permission to talk about her when she is in a meltdown. She told me that I could share a very short video of her whilst in a meltdown so that, in her words, "people can begin to understand what it feels like." But her body language while we were talking screamed a big fat NO! So what I have done instead is take screen shots from two points in the video to show what Autism masking can look like. Before you read on, please no judgement. Until you have walked in our shoes, walked in my nine year old daughter's shoes, please do not judge. We don't record this behaviour to humiliate her. We record this behaviour to show what an autism meltdown looks like. Please keep an open mind. This shows a child who at this point in time could not find the words to verbally express how she felt. This shows a child who knows that we are her safe place. We won't judge, we will still love her unconditionally and we won't try to stop her. We will simply stand back and allow her to vent her pent up frustration and anxiety. We have no choice but to let her vent and get it all out. This shows a child who has successfully held her anxiety at bay all day whilst at school. This is a child who has successfully fooled her teachers at school into thinking that she is okay. This shows a child who is expending so much energy during the meltdown that she will collapse once her body has rid itself of the anxiety that has been eating at her all day. This shows a child whose strength increases ten fold during a meltdown with the adrenalin that is pulsing through her body. This shows a child who knows that if she was to exhibit this behaviour at school, she would be frowned upon by her teachers, the school officials and her peers. This shows a child who knows that to stand out from the crowd is generally not a good thing - she will be singled out, she will be bullied. This shows a child who is in so much distress that all she can do is writhe around on her bed screaming nonsensical sounds and thrashing her body in all directions, lashing out at whoever comes near her. And yet if we walk away, that makes the situation so much worse. 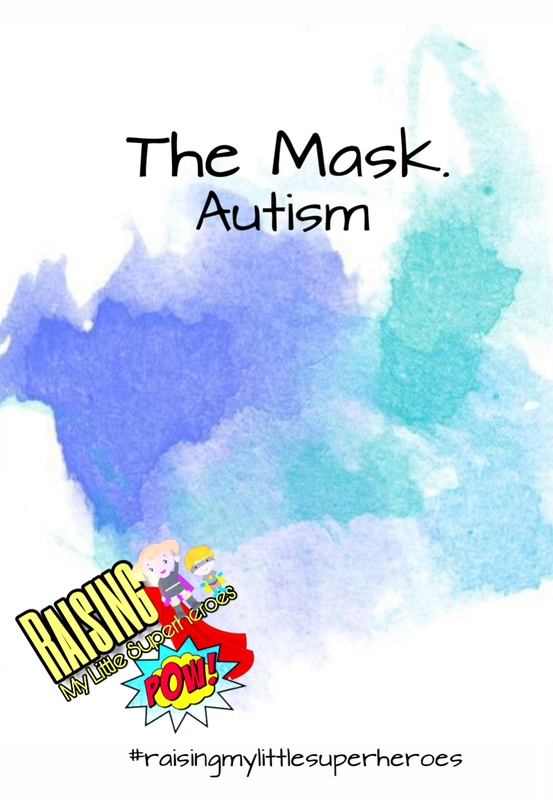 This shows that the mask of autism is very real. And unfortunately for many individuals who have been diagnosed with autism, this is a much too regular occurrence for them. There is so much pressure for individuals to suppress their autism so that they fit into the world around them. And the end result of suppressing and holding in their anxiety, is this. A meltdown. For individuals who have been diagnosed with autism, meltdowns do not stop when they turn the magical age of eighteen. I know many adults on the spectrum who find themselves in a state of meltdown well after they turn eighteen. The one thing that you can do is be supportive. Please be supportive of parents who may describe this behaviour in their children. Please don't be dismissive of them. Please be supportive of adults who tell you that they themselves feel that they are struggling with the environment around them. So the next time you see a child, or an adult, who is struggling, what will you see? What will you do?